Start your day with superhero snacks, before you secure your red superhero cape. Unleash your super powers, as you run alongside real superheroes. Before and after the race, enjoy music, magic from the Surfing Magician, Kids & Art craft tables, face painting, succulent pots, and much more. Super Fun Run Passes: $35 includes red superhero cape, Jacob's Heart reusable water bottle, superhero snacks, all activities, and cool swag. Golden Tickets—ala carte activities: $5 for one activity. Activities include: yoga, arts & crafts, succulent pot, and superhero snacks. This ticket is great for parents or children not participating in the Super Fun Run. 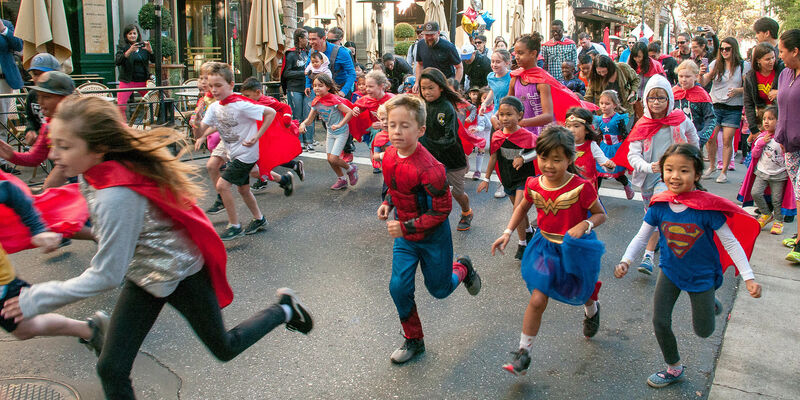 Includes: Super Fun Run, Red Superhero Cape, Jacob's Heart reusable water bottle, swag bag, face painting, arts & crafts, and superhero snacks. Good for one activity/meal at the Super Fun Run. This is a great option for parents or siblings not participating in the run. Jacob's Heart Childrens Cancer Support Services has partnered with Give Lively to securely process your online donation. This transaction will appear on your credit card statement as "Jacob's Heart Childrens Cancer Support Services". This transaction is subject to Give Lively's Terms and Privacy.